Oct 2012 Purchased this 2007 Mercedes ML350 AWD, in perfect condition, with 87K miles on it. 3.5L 6-cyl 268HP. Premium gas min 91 octane required. EPA 17 City 21 Hwy. Almost a year later now, with 102,500 miles, friends still say it looks new. This is a great car. Always smooth driving, solidly built, no visible wear, due to MB quality materials and build quality. Average MPG is 21.1 by actual tracking. In movies and songs, legendary! Mercedes Benz was for the rich, to drool over at the auto shows, something beyond my reach, a dream car that just seemed unattainable. In 2010, A friend suggested a pre-owned one, and I was amazed at what a nice '05 C240 we found. For less than the cost of a new 'ordinary' car, we found we could actually own a Benz! That car still serves us well, and in 2012 we bought our 2nd Benz, this '07 ML350. Again purchased for less than most 'lesser' cars would cost as new, we could have a Benz! A 5 year old Benz is more solid, has the potential to last longer, performs better, is a higher quality ride, and provides much more owner satisfaction than a new ordinary car! That's my story, and I'm stickin' to it! 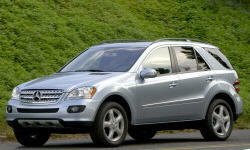 Why the 2007 Mercedes-Benz M-Class? Last week we transported two 6-foot folding tables in it, along with a half-dozen card tables and a 4-foot cooler, as well as much more stuff, and it held it all! Pulled my full-size farm tractor out of a stream bed with it two weeks ago, and it did not even breathe hard. So far, I love this vehicle! Mercedes Benz! The pinnacle of automotive quality. In movies and songs, legendary! Mercedes Benz was for the rich, to drool over at the auto shows, something beyond my reach, a dream car that just seemed unattainable. Harmon Kardon 11-speaker auduo is the best-sounding car I've ever owned. A 6-disc CD in the glovebox, , AND a seperate single-disk player behind the nav system for quick disc accessibility. MP3 player input also. The built-in nav system works great, and is integrated into the odometer car computer display. Again, the est and coolest electonics ever. This is where the car excells! Super-smooth quiet ride, like riding in a super-solid well protected vault. Great for trips, you do not get worn out from the road with a ride this comfortable! Why Not the 2007 Mercedes-Benz M-Class? Its classified as a 'light truck'. All my previous cars (Porsche 911, Toyota Celica, Olds Starfire, Saturn SC2) have been sporty cars, so that kind of handling was the hardest thing to give up. Sure it's got a great ride for an SUV, but it is still a 4700 pound vehicle.